I drive hundreds of miles every week, I write about technology for a living, I've been a TomTom user for years and I own an iPhone. 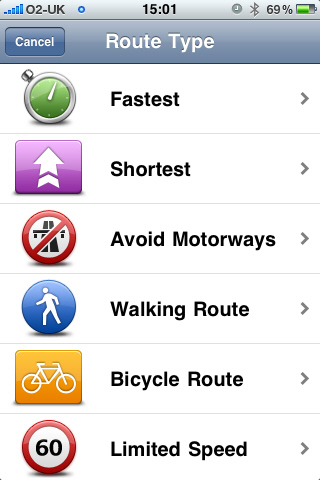 It had to be done, I just had to review the TomTom satnav app for the iPhone. Being both an iPhone 3GS owner and a happy TomTom satnav in-car user, like many people I had been waiting for the iPhone TomTom application to arrive. The delays seemed to go on forever, and in the meantime other players had entered the market: both Navigon MobileNavigator and ALK CoPilot Live launched before TomTom got into the App Store. But first is not always best, and as TomTom is pretty much the undisputed market leader I decided to hold out and wait for it to finally arrive. Not that it has finally arrived as I was hoping, by which I mean that the software application itself is now in the iPhone App Store for download but the hardware side of the product has yet to be released to retailers. I asked TomTom about this lack of the car kit at the moment, and a spokesperson told me it is "in the process of fine-tuning it so it lives up to the standards and quality we set for our products, and plan to announce the availability and pricing later this summer." Apparently a commercial decision was taken to make the software available despite the car kit not being ready just yet. "Although using the two together will certainly optimise the experience" TomTom says "they work as standalone solutions" so I thought I would put that claim to the test. Not just the 'I've had the thing for 30 minutes and I'm now ready to review it' which often appears in the rush to be first on the web to have a review of a new product, but a the kind of real world review you can only get by listening to someone who has actually used the product being reviewed and used it over an extended period. In the case of TomTom for iPhone I have been using it every day since it became available, which means the best part of two weeks now. I've used it when driving well known local routes, and I've used it when driving halfway across the country without a clue where I am going other than the address I have been given. Along the way I have uncovered just how well this particular satnav solution performs in terms of routing, display, GPS signal lock, speed and battery life as well as being able to compare it to my dedicated in-car TomTom satnav device. Just for the record, this review is based upon TomTom for iPhone UK and Ireland edition installed on an iPhone 3GS. The in-car testing was done using a Nissan X-Trail. OK, so let's start at the beginning with the cost. TomTom is clearly positioning itself towards the premium end of the iPhone satnav market. Of the big three products available at the time of writing, TomTom (UK and Ireland) is the most expensive at £59.99 (US $98) ahead of Navigon MobileNavigator which costs £52.99 (US $86) for the UK edition and the undoubted bargain of the bunch ALK CoPilot Live which comes in at just £25.99 (US $42) for the UK maps. Although there is still no sign of confirmed pricing for the TomTom in-car kit, we did break the news recently that one online retailer had been spotted taking pre-orders at £113.85 ($193.75) which works out to £99 ($168.50) plus tax, for the car kit. TomTom's official stance on this remains "As we have not confirmed pricing for the iPhone app, we are unsure why this website is quoting that price." Whatever the end price, it will only help confirm the TomTom solution as being a premium priced product, so does it deliver in terms of performance? There have been quite a few complaints within the App Store customer reviews regarding poor GPS reception, with some claiming to be unable to get a lock at all while others maintain that the application would always be stumbling around a few yards behind the actual position of the car - not ideal if it tells you to turn left after you have driven past the street in question. Equally, the GPS complainers recount how rerouting is painfully slow. Some even state that this is in stark contrast to applications such as Google Maps which get a GPS lock on the same iPhone without fuss and hang on to it accordingly. I am not suggesting that their experiences are not real, but I can only review the product as I personally found it: and I found it to not only lock onto a GPS signal very quickly indeed (a matter of a few seconds) but hang on to that signal no matter where I drove. I live in a pretty rural location but TomTom for iPhone always knew where I was, just as it did when I ventured into built up areas including large cities complete with tall buildings. Quite simply, the GPS signal never let me down once and that included a mammoth 5 hour cross-country drive with just a couple of stops to answer the call of nature and grab a coffee. Now this GPS performance surprised me, and I will explain why. For a start, I did not expect an in-car native iPhone GPS signal to be much cop, to be honest. Especially as one of the main selling points of the in-car kit that TomTom assures me will be available before the end of the Summer (it had better hurry up as Summer is fading fast here in the UK) is a built-in SiRF Star III GSC3f/LPx 7989 GPS chipset and antenna for enhanced GPS performance. You would have thought that was the kind of price boosting component that would only be included if the iPhone hardware was inadequate. Yet there I was, driving around with a rock-solid GPS signal with my iPhone not placed on the dashboard or windscreen, in fact with no clear view of the sky at all! I had the iPhone sitting on a bean bag inside the dashtop glovebox on front of the driver in the X-Trail, with the box lid resting down on the top of the landscape iPhone to keep the sun off. Yet it managed to lock on and retain a good enough GPS signal to ensure it always knew where I was, without any obvious lagging behind my actual position, and even re-route in the blink of an eye when I deliberately went off the planned route. To say I have been impressed by this performance is an understatement. I was equally impressed by the mapping and routing, allowing for the fact that I have yet to find any satnav which gets things 100% right 100% of the time. Full seven digit postcode input is supported, or you can use the usual array of streets, maps, points of interest etc to plan a route. 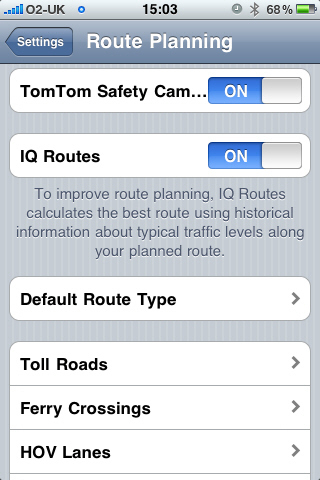 TomTom for iPhone uses the latest TeleAtlas maps just like the dedicated in-car products it sells, and they come complete with TomTom IQ routing technology. This basically calculates the quickest routes based upon the time and day of the journey, drawing upon the experience of millions of TomTom users who have driven those roads before you. It manages to base your route calculation upon the actual speeds of those drivers compare to speed limits, and manages to get it right most every time in terms of the most efficient route taking into account distance and speed. As I've already mentioned, go off route and the automatic rerouting kicks in. I found this to be very quick, in fact comparable to the standalone in-car TomTom solutions. But perhaps most importantly the maps on the iPhone, which I kept in landscape mode during my drives, were clear and precise. They scrolled very smoothly, zooming automatically, and were accompanied by a nice loud voice of my choosing to call out the turn by turn instructions. Unfortunately these were of the turn left, turn right variety instead of calling the road names. Equally unfortunately, the TomTom for iPhone interface is missing the hugely useful (especially when you drive as many motorway miles as I do) advanced lane change guidance which shows you exactly where you should be when motorways merge or junctions approach. The biggest omission from the maps side of things, though, has to be the double whammy of no mapshare support at this time and no TomTom LIVE services. This means that without mapshare support you cannot report when the maps have got it wrong (road is one way, doesn't exist or whatever) and upload that information so that the whole TomTom driving community can benefit by having their maps and routes updated. Quite incredibly though, given that the iPhone is a smartphone and that data is at the heart of the beast, the lack of LIVE service support means there are no traffic reports so no routing around the jams. I can understand the lack of data support for the iPhone when using a standalone TomTom satnav, that's more to do with Apple than it is TomTom after all. But given that the application is running on the device itself, I can see no reason why data integration should not have been available from launch. I can only assume that it will be added on later as an upgrade, no doubt at additional cost but then again LIVE services carry a subscription fee for in-car products so that should not come as any real surprise. 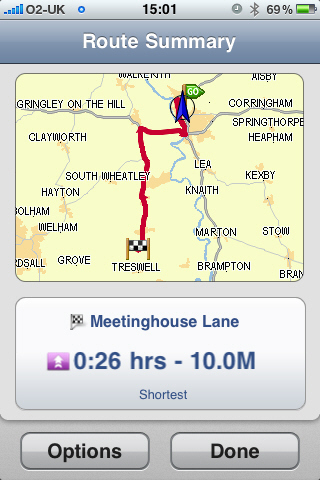 You do get a freebie in the form of built-in speed camera alerts on TomTom iPhone which was a nice surprise. Talking of no surprises, I was a little taken aback to see people complaining that the iPhone battery was being drained quickly by TomTom, as if that was not going to happen with something that is pushing the iPhone to the limits in terms of the hardware being used. I would not dream of using an in-car satnav of any kind on battery power, to be fair, and the iPhone should be treated no differently. Just for the purposes of review, however, I did unplug it from my cigar lighter adapter to record the rate of battery depletion. I guess the best word to sum it up is fast. I lost 45% of battery capacity in 1 hour of usage. No surprise there then. I was kind of expecting a poor performance when it came to contacts integration, the ability to tap on one of your iPhone contacts and be routed right to them, given the poor performance experienced by some App Store reviewers. But again, it was like I was using a different product to them as not a single one of my contacts threw up the dreaded cannot recognise address format message some report seeing all the time, it just routed me straight to the right address. The Points of Interest, although not supporting user editing at the moment, are well integrated with the iPhone. By which I mean that it is nice to be able to not only route to a POI by way of it being near to your current location, in a city, near your home, near the destination or along the route, but also to be able to place a phone call to those POIs using the same criteria. Talking of phone calls, all is not rosy in the telephony integration garden although you cannot blame TomTom for this one. If you get an incoming call while driving a route, you have a choice to make: accept the call and lose the routing for the duration, or decline the call. The iPhone cannot run multiple applications at the same time, so you will see an accept/decline screen when an incoming call is received and if you decline that's it, no interruption. Accept the call and you fall out of the satnav application until you hang up, then it restarts and dumps you back into the route you were on before. Obviously, as you have been moving there will then be a slight delay while the GPS gets a lock again and puts you back on the right bit of the route. This is annoying, if you take a lot of calls when driving. Personally it's not a problem as I very rarely accept calls when on the move, preferring to concentrate on the task of getting from A to B without killing anyone, so no biggie. If you'll excuse the pun, your mileage may differ. So, do I think it is worth the money? Ultimately yes, even though it is currently missing some bits that I would want before I will switch from standalone TomTom satnav to the all in one iPhone solution. Those bits being the in-car kit, mapshare support, LIVE services for traffic avoidance and the advanced lane change advice. Once they arrive this will be so good that, dare I say it, we could be looking at the start of the end for dedicated in-car satnav units. When phone-based navigation is this good, why bother with anything else? 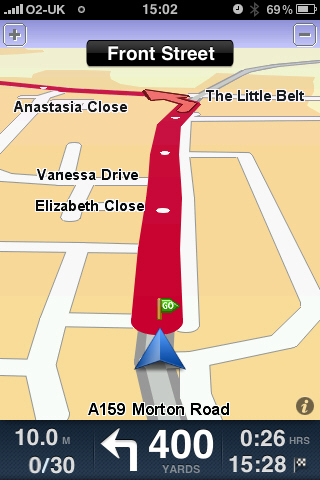 If I was giving it a rating out of 10, TomTom for iPhone would currently be an 8. I have now added screenshots of the TomTom app, and there is also a review available of the CoPilot satnav app for the iPhone here for comparison. Are you suggesting that professional drivers (trucks, bus, taxi, ferries, etc) should use this combination of hardware & software? 8 / 10? More like 1 / 10. Several points: Iphone is NOT a commercial smartphone: unfree music (unless crackware is used), no camera flash, poor camera, poor memory & battery expansion, etc. My Nokia smartphone was bought second-hand from a taxi-driver. He was not an tech freak: so it showed his daily GPS books, income & expenditures, maps, web-cam to his baby's cot at home (via 3G link to the house computer, etc. Personally, I'm not into Nokia open-source operating system now. Waiting for android Samsung OLED to grow up ... with standard stereo loudspeakers, standard headphone jack, bluetooth (to my external bluetooth GPS receiver/ roof aerial, and A-GPS. GPS without A-GPS is useless in many places. The iPad Is Cool But Can It Run Linux?